Depending upon the task at hand Changing Places can structure its commercial arrangements, tailoring them to your specific needs. After initially meeting with you to gain an understanding of your requirements, their complexity, timing and likely outcomes, we will be able to provide insight into whether the engagement is more suited to an hourly rate, a fixed price engagement or an ongoing retainer and you will be able to consider how best to proceed. The key to success is to begin with the end in mind and to tailor the engagement to your needs. When you are deciding how to proceed, it is important to keep in mind the trade-offs involved with any approach to job costing or purchasing. You have the three options fast/good/cheap and can select any two. It is important to begin with the end in mind. If you need something fast then it is likely to cost you more as we will have to re-prioritise our work, delay other projects or bring in extra resources. 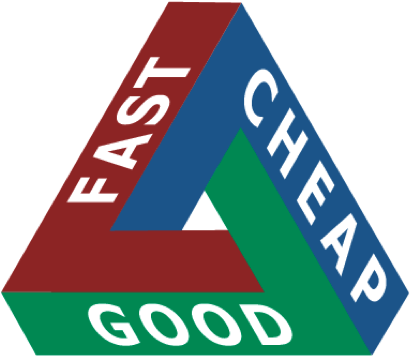 In reality fast and cheap don’t go together unless you are satisfied with lesser quality workmanship. Good quality work takes time and effort. We give you good value for money so we are not cheap by comparison to others with less experience or who are satisfied with providing lesser quality. If it is cheap that drives you then please understand that your work may take an extended period of time as it will need to be fitted in amongst gaps in our scheduled work for full fee paying clients. In reality, these trade-offs are not new. Consider the words of the British Prime Minister and Philosopher John Ruskin around 1850. At Changing Places we are committed to giving our clients value for money. We recognise that your satisfaction as a client determines our success as a business, because our consultancy is built upon our reputation and referrals.